Investigators believe they have identified (and may or may not have arrested) a suspect in the Boston Marathon bombings, according to CNN. The breakthrough came from analysis of video from the Lord & Taylor department store near the site of the second explosion along with video from a local TV station. Earlier, police released images of a pressure cooker they believed to be part of the bomb that killed three spectators and injured almost 200 others. But, the keen eye detectives over at 4chan have concluded their investigation and have IDed three possible suspects. This guy is not a suspect. FBI initially passed out images of Salah Barhoun, 17, seeking to gather more information on him, but Salah went to the authorities yesterday to clear his name after he found himself tagged in pictures online. The other man singled out in the images, above, is also not a suspect. The real suspects are below. 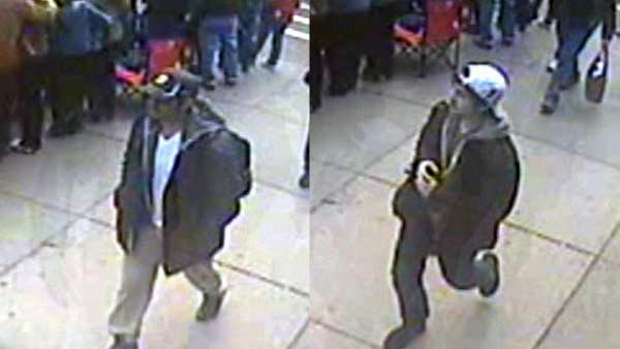 Update, April 18: The FBI has officially named these two men as the suspects. The agency released photos and videos (below) of the two men the are seeking. If you know these terrorists, call 1-800-CALL-FBI. Update, April 19: The suspects have been identified as Tamerlan Tsarnaev, 26, and his brother Dzhokhar Tsarnaev, 19. Tamerlan was killed in a shootout with police last night. Dzhokhar is still on the loose. This is believed to be his Twitter account. Dzhokhar was found hiding in a boat in a Watertown, Mass. homeowner's yard, below. According to reports, shots were fired. The Boston Police has confirmed Dzhokhar is in custody.